What is it? – Choose Your 2012 is an achievement-based game of destruction, where your primary goal is to annihilate the world with godlike weaponry. Who made it? – The game was developed by Pyrozen. How does it play? – A simple mouse-driven control scheme lets you rain down terror from the heavens with ease. The world is broken up into several areas, filled with recognizable regional landmarks like the Statue of Liberty, Eiffel Tower, and even Disneyland. Different parts of the world can be accessed instantly via the world map. Your attacks are accessed via another menu. You’ll begin with the basic ability to hurl meteorites, but you’ll also unlock other options, such as tornadoes and earthquakes. There are also 30 achievements to complete, viewable via a third menu. Hovering the mouse over a task will tell you how to accomplish it. Your only enemy is the ever ticking clock, though you can save the game after each playthrough to retain your accumulated achievements. Presentation – The graphics have a clean and pleasing look, while still being detailed enough to make each structure easily identifiable. Once things get going, and you’re able to unleash multiple powers at a time, the chaos is extremely satisfying to watch. 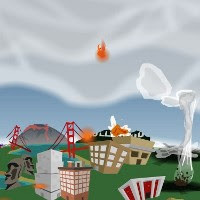 Positives – Quite simply, Choose Your 2012 is a basic, yet surprisingly addictive game. This is especially true if you bother to pursue the long list of achievements (which I highly recommend). It’s not even remotely possible to complete them all in one shot – you'll need multiple playthroughs to enjoy the full experience. Negatives – Sometimes it’ll seem impossible to demolish smaller pieces of buildings, due to a somewhat imprecise aiming system. This can be especially frustrating as you race against the clock. Why you should play it – Choose Your 2012 proves that death from above can be highly entertaining. The simple gameplay and pleasing presentation, coupled with the long list of achievements make this an addictive “one more round” game that you may have trouble putting down.